I find this type of poetry challenging to write – Emma gets her poetry skill from my father, not from me. I do love seeing how the meaning of the poem changes as your read it starting at the end. Author Marilyn Singer is quite the reverso poem expert – this is the third reverso poetry picture book she has written. Be sure to check out her first two as well! Both Mirror Mirror and Follow Follow are based on fairytales, making them more accessible to younger children. If you live in the US, I have a fun giveaway for Echo Echo! Entry is easy via Rafflecopter. The giveaway ends March 31st. Here are some more fun poetry activities for your kids! Poetry Name Poems (Acrostic Poems) – this is one of the most accessible forms of poetry! Easy Poetry for Kids: Spine Poems – another very accessible form of poetry! 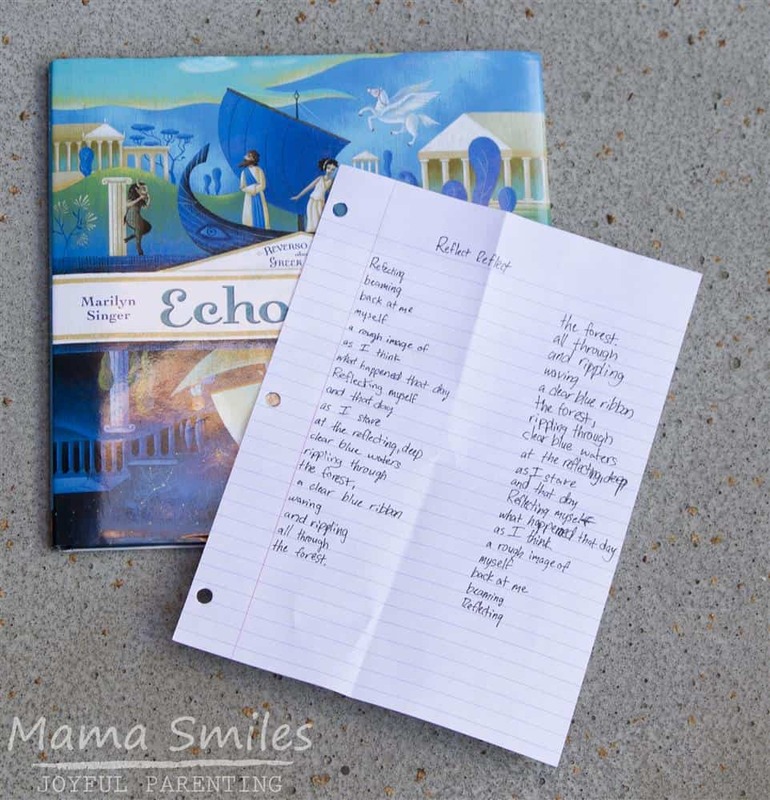 Do you have a favorite poetry activity or poetry book that we should check out? Let me know in the comments! Emma did well! I am very intrigued by this style. Thank you for linking to our poetry posts – you do know then our favorite poetry books, but if I were to recommend one, it would be Bill Martin Big Book of Poetry. That is one of my favorites as well! Emma wrote a great poem!!! What a neat form. She’s really got a good ear for poetry, I on the other hand have no ability to write it and sometimes don’t “hear” it well. My daughter would love this. She’s a big poetry fan. I find the idea of reverso poems intriguing. I love Emma’s poem! Interesting idea and the book looks beautiful. I made an error on my last entry I am following on twitter as @mzmyrtlezplace. I would love to win this book because my niece is an avid reader and would love this. Emma is so talented!! Her poem is wonderful! My students love Mirror, Mirror and lots are interested in Greek myths. I think they’ll love the new book! I’m dying to read this one now! I think it would be great for homeschooling. i would like to win for my nephew! I love poetry and I think my little bookworm would love this book! I would like to introduce my daughter into the power of poetry. I think this would be a perfect introduction! The pictures look beautiful! It would be a fun book to read aloud to my girls. A great book of poem can melt the stresses away and stimulate creativity. Besides staying on the computer all day is no fun. I am introducing poems to my son. He is really into how words flow right now. The plus side. He really likes Greek myths! I’d like to win this because I think that my niece would love it. I would like to win this because I think my daughter would really enjoy it.